I've been promising myself a day where I 'just run' before the marathon schedule kicks in next week so I headed off on Friday morning along the ridge and down toward the river. My Garmin behaved very badly for the first 5k, the pace just didn't look right although I did enjoy a few moments of thinking I could suddenly run fast. 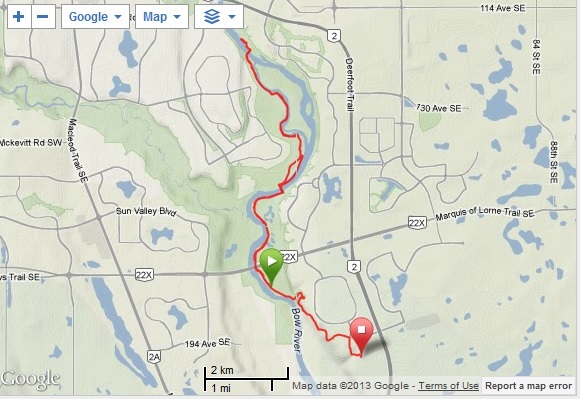 I thought it had adjusted the lap distance but later on when I got home and downloaded it, it had me running in Auburn Bay? After switching it off and resetting everything I could think of, it recovered itself and I kept running. I ran over the bridge to Bankside (8k) then took the gravel path next to the river. This is my regular summer water stop and it is now open! The area beyond had a grass fire a couple of weeks ago and already there are green shoots coming out of the black. Amazing. 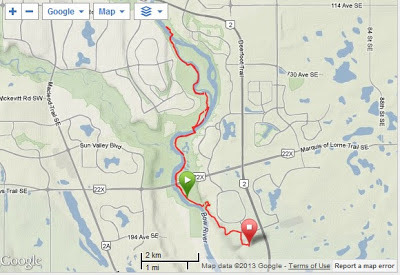 I continued up to Mallard Point then across the river to turn around next to Douglas Glen (12k). As I made my way back I realized coming so far out was not smart as I could feel pressure in my knee at 15k. I walked then ran for a bit but the pressure was rapidly turning into pain. So at 16k I knew I was going to be walking back. There was no pain walking thank goodness. Two hours later I made it home. Distance: 16k running, 9k walking. Time: 4 hours including breaks. Good thing I wore sunscreen. No PR attempt for me in the Calgary Half on May 26th. In fact, I'll be happy to finish. This is driving me crazy.